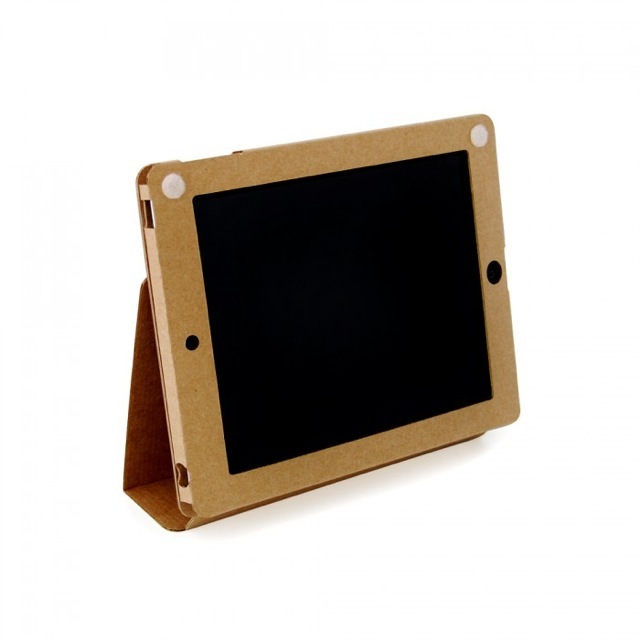 Cardboard iPad Cases? Kid-Friendly, Cheap, and Effective! We, here at iPad Kids, know just how important protecting your iPad can be. This is especially true if you have a toddler or pre-school aged child. Between the boogers, the sticky fingers that have who knows what all over them, and of course, the perilous, heart attack inducing moments when your $500 device is hurtling toward the hardwood in slow motion, having an effective case is REALLY important. So, all of that said: Would you use an iPad case that is made from nothing but cardboard? Before you say no, check this thing out! For a mere $7, you can own a piece of cardboard that has been folded into the shape of an iPad case. Apple Pie USA is the maker of these cases and the idea has really left me asking “why?” As in…”why cardboard?” At first, I was skeptical. After all the emphasis parents put on iPad cases’ durability, shock absorption, handles, stands, and overall childproof-ability, why on earth would I want to put my $500 iPad into a $7 cardboard case? Well, here’s why. While it may not protect your iPad if it is hurled down a flight of stairs or into a swimming pool, it will protect from sticky hands, normal wear and tear, and even the occasional slip and drop. It also folds back into a stand for the iPad. Best of all? Your kids can color on it. They can write their names, place stickers, glue, glitter, and whatever else your craft box can dish out. What child wouldn’t love to use an iPad case that they created themselves? Of course, you would want to leave the iPad out of the case during the decorating process. At $7 a piece, these little cases would make an excellent party craft, personalized gifts for grandma and grandpa or just a fun rainy day project. All of this isn’t to say that you should throw out the Otter Box, but honestly, this cardboard iPad case isn’t as crazy as it sounds. Click here to snag a 3-pack of the cardboard cases for only $16.99! 2 Responses to Cardboard iPad Cases? Kid-Friendly, Cheap, and Effective! I just recently purchase one and it is great. The fact is that it protects the same if not better than other iPad cases. I use my iPad for business and its fun to bring into meetings too after my little girl doodles on it. Great idea to have the kids decorate it, thanks for the feedback!